The Chicago Bulls know there is always room for improvement. After a 1-3 start, that’s become even more evident, but Joakim Noah and the Bulls are hopeful that Friday’s game against the winless Utah Jazz at the United Center will help get them moving in the right direction. 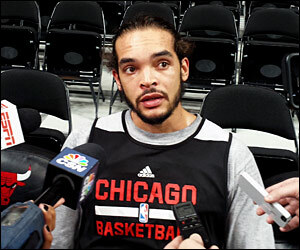 “We’re a work in progress,” said Noah following the team’s Friday morning shootaround. “We’ve just to keep grinding. It’s gonna come, it’s gonna come. We’ve worked too hard. Bulls coach Tom Thibodeau is also working to ensure his team doesn’t overlook the Jazz. Indeed, the aforementioned losses to Oklahoma City and Phoenix were by three points apiece, and against Houston, the Jazz led by 16 at halftime. It’s those kind unfinished attempts which have also hurt the Bulls. Thibodeau sees the need for a complete effort to help get Chicago back in the win column, something he didn’t get out of his team over the last two games when halftime leads against Philadelphia and Indiana disappeared. Part of that could very well mean restoring the team’s trademark defense. The Bulls have allowed 98.0 points through four contests this season. In comparison, since Thibodeau’s arrival in 2011, Chicago has ranked second (91.3 ppg) in 2010-11, first (a franchise-record 88.1 ppg) in 2011-12 and third (92.9 ppg) in 2012-13. Wednesday marked the first of four meetings between the Bulls and Pacers this season. Last year, Indiana came up one game short in the Eastern Conference Finals, falling in Game 7 to the eventual champion Miami Heat. The Pacers improved to 5-0 after pulling away in the second half against the Bulls, and after the game, All-Star forward Paul George made it clear he believes now is Indiana’s time. When asked about George’s comments, Noah acknowledged he was aware of them but didn’t fuel the fire. While Derrick Rose has said he does not see a rivalry with the Pacers, Noah doesn’t want to concern himself with anyone but himself and his own team.